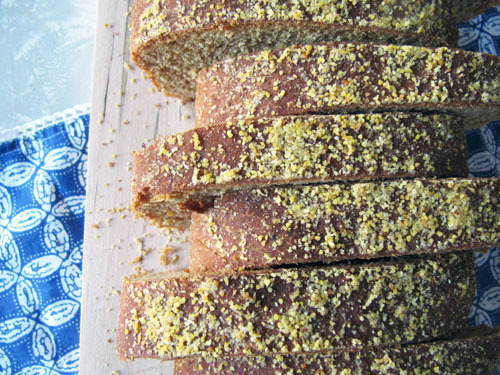 Rumor has it, this bread was named after a sassy husband and his wife Anna. So now you have it. 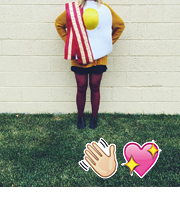 Unlike that sassy husband, I love corn meal everything. If it was up to me I’d call this bread Thanksanna Bread. But who am I? 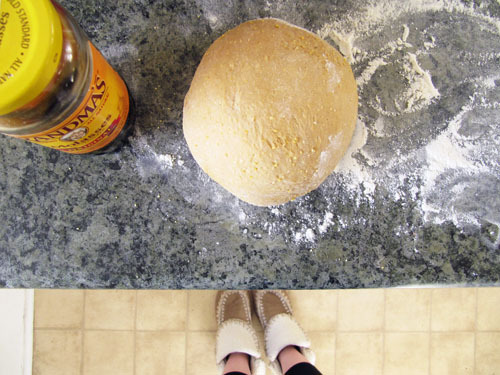 I love corn meal and my fake Ugg (fugg) slippers and grandma’s molasses. I have a feeling that Anna and I would’ve been friends. I bet she’d buy milk because the carton is pink. 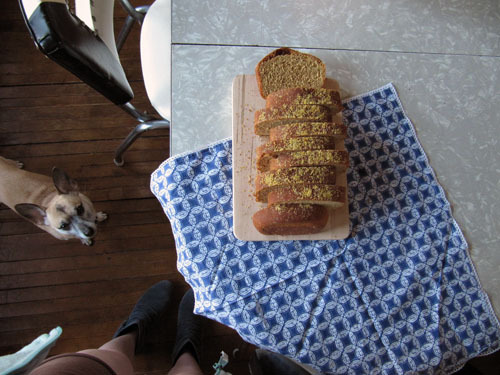 And she’d keep baking this bread even if her husband hated it, since she seems like a “I do what I want,” kind of girl. The moral of the story is this: if you have a wife making you homemade bread, don’t bother being a diva about it. P.S. This bread is tasty. It has just a hint of molasses flavor and tasty corn meal goodness without being gritty. P.P.S. Molasses is like bread bronzer. Look at that tan! 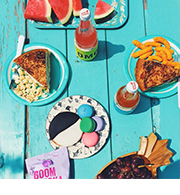 So yeah, this is a tan beach-body bread. go outside with the pup. See Elliot judging my silly outfit? Heat your oven to 200°F for 10 minutes. Turn it off so it’s warm, but not hot, for your dough to rise. Proof the yeast by whisking it into the warm water. Set aside for 5 minutes, or until foamy. Meanwhile, in a small saucepan heat the milk and butter until the butter is completely melted. Add 1/2 cup corn meal and stir over a medium heat for a minute. 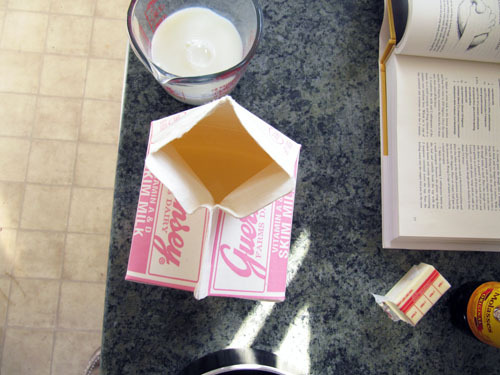 Remove from heat and transfer to a small bowl to cool a bit. Whisk the molasses into the foamy yeast mixture and set aside. In the bowl of a stand mixer, fitted with the dough hook, stir together the flour and salt. Add the corn meal mush, mixing at a low speed until roughly incorporated. Gradually add the liquid and once the dough comes together increase the speed to medium and knead until the dough is smooth and satiny (5-10 minutes) and no longer sticks to the side of the bowl. If it’s sticky still add flour a tablespoon at a time up to 1/4 cup. 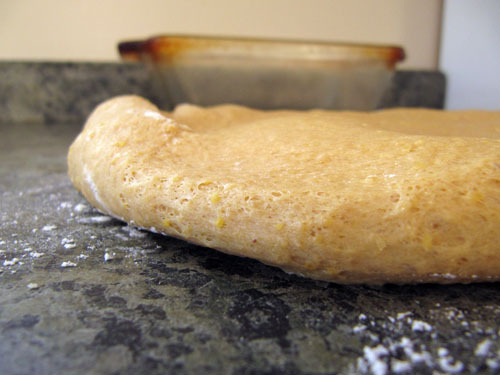 Place dough in a greased bowl, turning to coat. Cover with plastic wrap and place in the warm oven to rise until double in size, about 1 1/2 hours. After it’s risen turn, turn it out onto a clean surface and pat into a 9 inch wide rectangle, about an inch thick. Roll up pinching at the seam and place in greased 9×5 inch bread pan, seam side down. Cover with plastic wrap and place back in the warm oven to rise until slightly taller than the bread pan, about an hour. Remove from the oven and heat the oven to 350°F. Melt the additional 1-2 tablespoons of butter and brush over the risen loaf. (I found that I only needed about 1 tablespoon.) Sprinkle with the 2 teaspoons of corn meal and set aside until the oven has heated. Bake for 40-45 minutes, or until the top sounds hollow when flicked or if you’re fancy, when an instant read thermometer reads 195°. Cool completely. 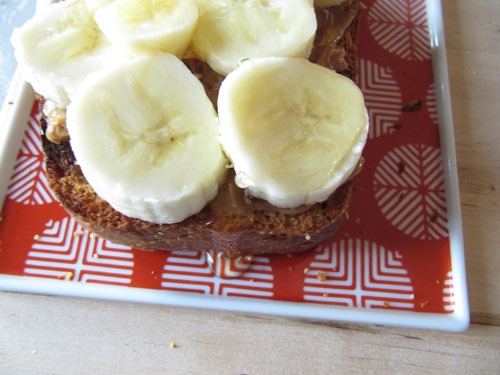 This bread makes darn good toast topped with peanut butter + bananas + honey. Thanks Ai! I’m glad we mutually love corn meal more than anything. 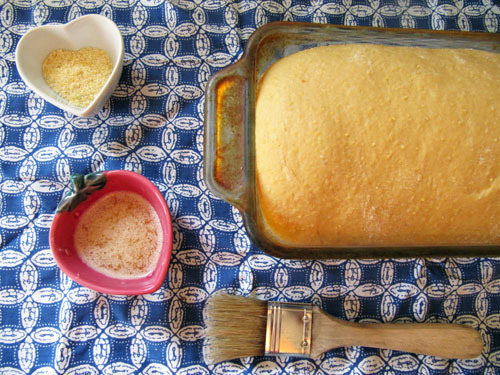 I’m a HUGE cornmeal fan, too, so this is a bread recipe I can definitely get behind! Your slippers are cute, too! Awesome, Sydney! Corn meal just makes everything better. Love the slippers..the bread..the cute puppy..and you!